A good care of your mobile increases its usage period. Want to keep your iPhone safe from just about everything. Most waterproof cases are pretty bulky and make you to pay for your iPhone protection with both size and weight. Here, I round-up the best top iPhone 4 and 4S cases available in the market. So, have a look at this article to know few iPhone cases to protect and make your phone to look attractive with some extra style. This is one of the best minimalist ultra-slim hard-shell protective casing to your iPhone 4 and 4S. Some mobile users think that the case will cover the beautiness of iPhone, but you can cover it up with bright colors in order to show your smart mobiles along with protective case. With this you still have a good grip from getting into damage. This sleek design protects your iPhone from the indignities of the outside environment. The cases are available in white, black colors with various models. Make a perfect companion for your iPhone from sudden damages. Its polycarbonate shell has rubber edges to safeguard from damage. This case makes you feel comfort in accessing all its ports and switches. If you are serious about protection of your iPhone, it is necessary to use a protective case like Lifeproof that match your lifestyle. According to military specifications this ultra protective and fully sealed case was designed. With this, you can make your smart phone to access all of its capabilities as and when you want. A waterproof case will extend the life of your iPhone from being damaged. Many mobile users opt this as the best one because of its waterproof, shock-proof and dust-proof features. With its sleek design, it not only protects your iPhone, but also makes your mobile to look smarter. This case will let you access and get most out of your iPhone accessories. With the protective Lifeproof case, you can take your iPhone in the water up to 6.6 feet, snow and dirt areas. It is a different protective case crafted with a single block of bamboo. Grove Artist Series case is a perfect hand sanded and look like a natural and classic piece of furniture. Opt from a plain case and make it your own with a custom designs. It is available in a variety of choices like amber or natural color designs. It is a beautiful and natural handmade bamboo case with two piece slider design for protection. Is your smartphone fits? Yes, Is it available in various designs? Yes - ranging from sleek to ornamental. If you wish to have a slide in style design, then WaterField Designs smart case is a perfect choice. A top-notch iPhone case available in different colors: blue, green, black, red, brown, copper, flame, pearl, pine and silver. A top loading rectangular sleeve case features a water-resistant nylon and leather accents on the edges. Look at this one more beautiful and perfect iPhone case to protect your mobile from damage. With its ultra lightweight design and attractive look, it is one of the top listed iPhone cases for mobile users. With front screen protection and easy access to all buttons, it is worthy to buy this type of case to extend your mobile life. 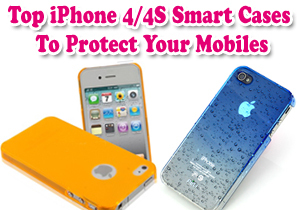 Look for the best and affordable protective case that exactly suits your iPhone requirements. If you are interested in suggesting any more protective cases for iPhone users, feel free to share your views in the comment section below. The author is a professional technology writer who is specialized in writing tech related articles. Currently he is writing quality articles on different topics like Mobile phone recycling.